I usually give two answers. First, I am a Ph.D. economist and I have spent many years studying how markets and marketing works. Marketing is essentially a branch of economics. Second, marketing is the enabler of Capitalism. It is the Engine of Capitalism. Without marketing, capitalism would collapse. I will explain this by first discussing how marketing works (see below). Marketing’s job is to create real value for some defined group. A company creates value by (1) developing an attractive product or service, (2) pricing it right, (3) placing it so that it is easy to find and get, and (4) promoting it so that the intended market knows about the product’s existence and develops a desire for it. 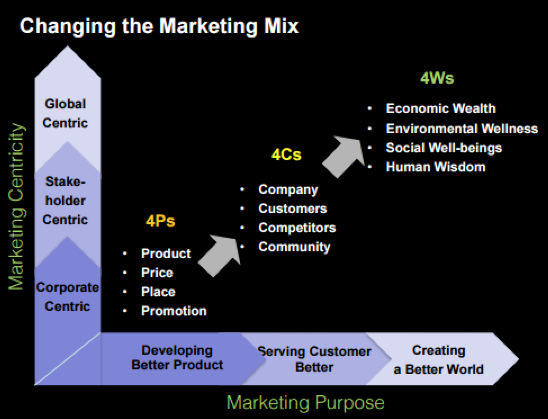 We call these the 4Ps of the Marketing Mix. Now a company should not set the Marketing Mix until it determines which customers it wants to reach, serve, and satisfy. A company can’t win all customers unless it is a monopoly. The company chooses a specific category of customers (e.g., millennials, retirees) and creates the marketing mix that would be most attractive to that customer segment. The company can succeed best if it is also aware of its competitors and is aware of the community at large and its values and beliefs. The company hopes to acquire economic wealth (profits) through its activities. Enlightened companies will also want to contribute to environmental wellness, social well-being, and human wisdom (the 4Ws). The company can focus on either itself, or its stakeholders, or the global world as a whole. The company can be judged by the public on whether it developed a better product, more satisfied customers, and created a better world. Now I am able to answer why I claimed earlier that Marketing is the Engine of Capitalism. Capitalism is the best economic system for producing the greatest volume and diversity of goods and services. For it to succeed, however, there must be enough buyers for all the goods and services that Capitalism is capable of producing. The Sears catalogs introduced millions of Americans to millions of products and services. The catalog’s arrival each period in American urban and rural areas was eagerly awaited. Consumers saw goods that they never imagined. Most of them described the Sears catalog as their “wish” book or “dream” book. The growing number of Sears and other department stores and boutique stores made many goods tangible and accessible and desirable. Newspapers, magazine articles, and the growth of the movie industry featured the life styles of the rich and famous and created an aspirational and accumulative American mindset. Buying was stimulated by the use of various tools such as.discounts, two for the price of one, layaway plans, rebates, zero-interest financing, gift certificates, coupons, guarantees and warranties, credit cards, subscription selling, branding. Marketing then faced a second task, namely, to convince consumers to borrow the money needed to buy the product. Most people don’t have the income to afford a home, a car, or a college education, let alone a second suit, expensive meals, or foreign vacations. The marketing of credit cards, mortgages and other credit devices made Capitalism possible. To understand our Capitalist economy, we need to replace the term “consumers” with the term “borrowers,” because that is the only way to keep an economy going when most people don’t earn enough money. So what role does marketing play in a Capitalist economy? It gets people to want and buy all the things that are made and it gets them to accept debt to obtain these goods. Capitalism flourishes as long as marketers can stimulate buying interest and gain public acceptance of debt. Is the job of marketing really to get people to spend money with credit cards? Could that be called irresponsible? And does that make marketers aiders and abetters of our debt – both individual and public? Marketing’s job today is to sell materialism and consumption. Tomorrow’s marketing will be markedly different. What alternatives are there? Should we make fewer goods and provide less employment? All of us have to see if capitalism can operate under a new paradigm that involves less consumer debt. Remember – our GDP depends 70% on consumer spending! I am personally not happy that marketing’s role is to tempt people to buy products that they might not be able to afford. An ethical company would confine its promotion to people who can afford these products and discourage would-be buyers who cannot afford the product. Thus an ethical real estate agent would tell a prospect who is poor that buying a particularly expensive home would be highly risky. If the prospect lost his job or ended up with high medical expenses, he would not be able to make payments on his mortgage. Or a car salesperson would say to a prospect who is poor that buying a Mercedes could get the buyer into trouble later That prospect would be safer buying a low cost Chevrolet. Even if sellers wanted to caution buyers, buyers are likely to resent being cautioned. Most sellers understandably find it easier to assume that buyers know what they are getting into and must take responsibility for their action. I welcome comments from others on how we might discourage people from not buying more than they can reasonably afford. Can we re-market to people the old debt-free life style where they stop using credit cards or refuse to finance their purchases? In more general terms, it is to be considered whether the concept of mainly rating economies by gross domestic product growth and companies by profitability growth respectively is out-dated on the pathway to a zero-marginal cost society. One word comes to mind. ….MATERIALISM. we live in a world that is driven” to aquire products whether we need them or not”. Another word would be “impulsiveness “. Definitely food for thought.